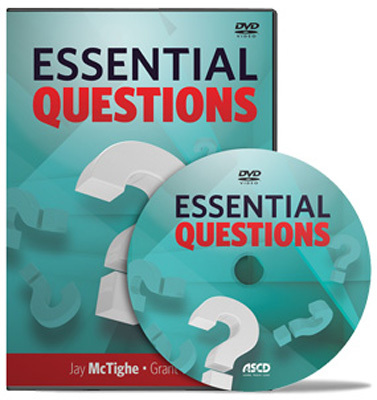 Based on the bestselling book by Jay McTighe and Grant Wiggins, Essential Questions: Opening Doors to Student Learning, this video provides practical advice for teachers on not only how to style questions that stimulate thought, provoke inquiry, and spark more questions, but how to transform instructional inquiry as a whole. This video brings the process to life with scenes from both a very special seminar taught by Wiggins and classrooms where teachers are successfully using essential questions in their instruction. The video also includes expert commentary from McTighe and Wiggins. They bring their years of experience in schools across the country to finding out, just what makes an Essential Question… essential! The best-selling book Essential Questions: Opening Doors to Student Understanding, by Jay McTighe and Grant Wiggins, is the basis for the new Essential Questions video from ASCD. Jay McTighe leads ASCD's Understanding by Design® cadre and brings a wealth of experience developed during a rich and varied career in education. He served as director of the Maryland Assessment Consortium, a state collaboration of school districts working together to develop and share formative performance assessments. Grant Wiggins (1950–2015) was the president of Authentic Education in Hopewell, N.J., a consulting, research, and publishing organization.